New Zealand Flags Great New Zealand Souvenirs. 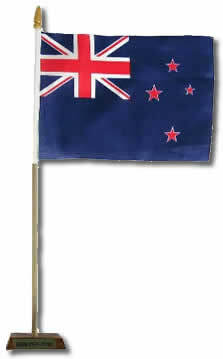 Our New Zealand Flags are the symbol of the realm government and people of New Zealand. Its royal blue background is reminiscent of the blue sea and clear sky surrounding us. The stars of the Southern Cross emphasis this country's location in the South Pacific Ocean. The Union Flag gives recognition to our historical foundations and the fact that New Zealand was once a British colony and dominion. The New Zealand Flag may be flown on any day of the year. It is particularly appropriate to fly it on days of national commemoration, such as Anzac Day, and on other important occasions. (This flag is 3 x 5 feet and has dome attachments for connecting to a flag pole). (This flag is 2 x 3 feet and has dome attachments for connecting to a flag pole). 12 June 2002 marked the centenary of the New Zealand Flag, which became our official flag amidst the pomp and patriotism surrounding the South African War. 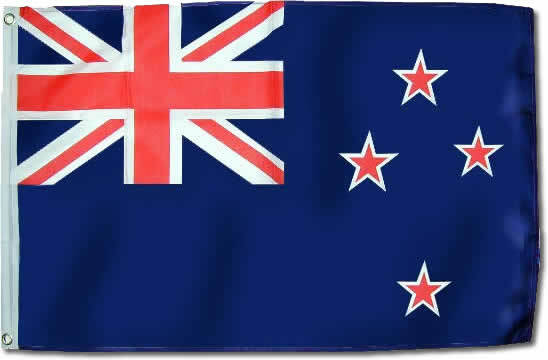 To mark this occasion, the Ministry delved into the maritime origins of the New Zealand Flag and looked at the history of previous flags used in New Zealand, including that chosen by the United Tribes in 1834 to be the first flag of New Zealand. From these early beginnings, the New Zealand Flag has gone on to represent New Zealand in almost every arena, perhaps most notably on the battlefield and the sports field. 100 years on, it continues to provide a tangible link to New Zealand across the world, from some of the most remote regions of Antarctica to the September 11 rubble of the World Trade Center towers in New York. The New Zealand Flag is even believed to have been on board the Apollo 11 when Buzz Aldrin and Neil Armstrong made their historic moonwalk in 1969! New Zealand Souvenirs Images copyright © 2006 - 2019 by Simply Souvenirs Ltd. All rights reserved.